This is a review of a tea that I received for my birthday in 2015. I won’t be doing too much digging into the costs of the gifts that I’ve received. 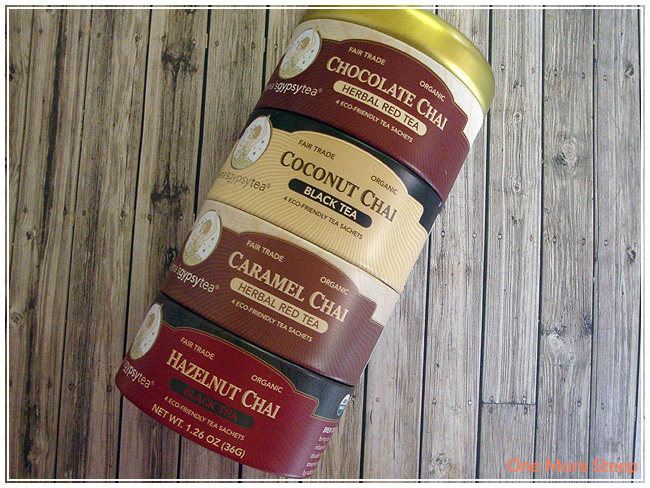 Hazelnut Chai comes it a really cute stacking sampler set, along with Chocolate Chai (herbal red tea), Coconut Chai (black tea), and Caramel Chai (herbal red tea). Each section fits well with the section above. For the most part, they can be rearranged, but Hazelnut Chai has to be the one on the bottom because it doesn’t have a bottom lip that can connect to another section of the tin. Each tea is represented by “4 eco-friendly tea sachets”. Each tin section comes with some information about the tea it holds (caffeine level and ingredients), as well as some general information. For the Hazelnut Chai section, to use fresh spring water that is brought to a rolling boil, and then infuse the tea sachet for 3-5 minutes. There are also some additional instructions for making an iced tea (doubling the amount of tea used) and to make a latte (by adding steamed milk). The Hazelnut Chai smells lovely, but it smells more heavily on the Chai side (that rich, aromatic spicy fragrance that many Chais have) rather than hazelnut. The tea sachets are round, so no string which means having to utilize a spoon in scooping it out (not a big deal), and each tea sachet contains 3g of tea. Which doesn’t actually make sense since the entire sampler (of 4 teas) contains 36g of tea which results in 9g of tea per type of tea, but there are 4 tea sachets per tea (which means it should be 12g for each tea, making it 48g total in order to have 3g of tea per tea). Like the rest of the teas in this sampler, Hazelnut Chai is organic and fair trade certified. The ingredients are: organic and fair trade certified Indian black tea, cinnamon, ginger root, licorice root, natural flavouring, cloves, cardamom, nutmeg, black better, and organic vanilla bean. Zhena’s recommends using boiling water that is poured over one tea sachet and to steep for 3 to 5 minutes. I opted for about 4 minutes. 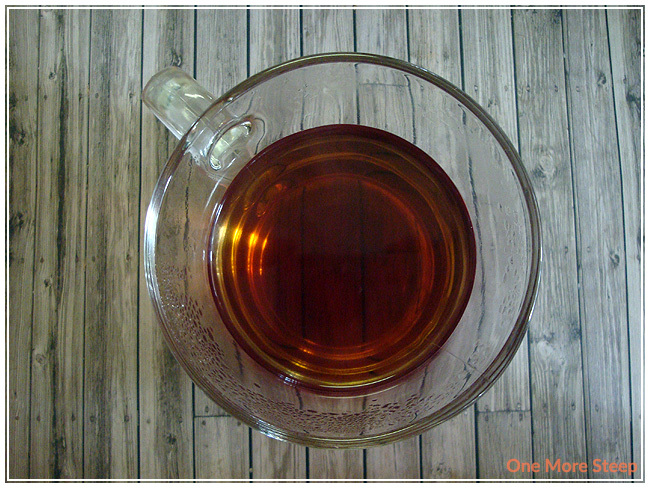 Hazelnut Chai steeps to a very pretty reddish brown colour. It’s clear, and has a beautiful spicy aroma to it. There is a bit of an oily mouthfeel to the tea that I noticed on first sip. There is no hint of hazelnut in the flavour, which I wasn’t too surprised with due to the lack of hazelnut fragrance in the dry tea sachet. There is a really nice balance of spice to with the black tea base and makes for an overall very pleasant cup of Chai. 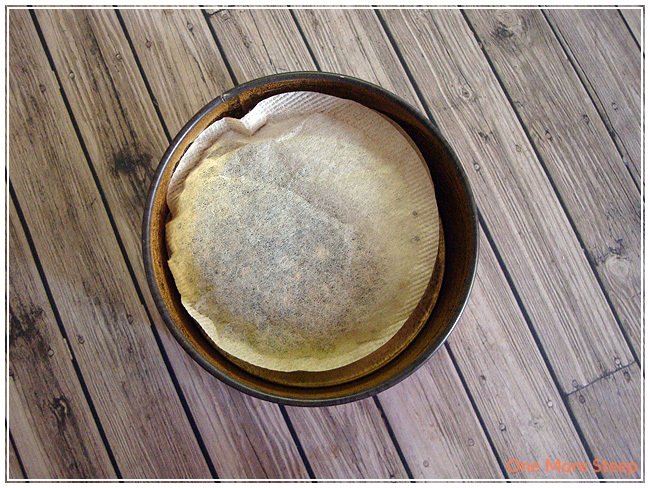 I am always a bit wary of resteeping tea sachets, because most companies that produce tea bags often use lower quality tea leaves or teeny bits of tea leaves. Unfortunately, Hazelnut Chai does not buck that trend. I tried resteeping it and the balance of spice is off, it’s not as strong as it was with the first cup. I thought that Zhena’s Hazelnut Chai was just okay. As a cup of hot Chai, it has a really nice flavour profile but it is sorely lack in the hazelnut department. I think it would make an excellent latte though. I tend to enjoy my Chais as a latte, so I’m going to be trying this tea again with the addition of milk. I do plan on reviewing the rest of the Chai varieties in this sampler first as hot teas, and then trying them all as lattes and posting an update on if I think they’re good as lattes.